Sherlock Frankenstein and the Legion of Evil spins out of the pages of the continually excellent Black Hammer series (issue #12, to be precise.) Intrepid journalist Lucy Weber continues to hunt for her father, superhero Black Hammer, and his former teammates. Unlike the rest of the citizens of Spiral City, Lucy believes Black Hammer and crew are missing and not dead. In Black Hammer #12, Lucy got the key to her dad’s old secret HQ from the former Dr. Star. In said HQ, she finds a prerecorded video from Black Hammer, asking her to destroy the lair and it’s contents, since if she is watching the video, something terrible happened to him. Lucy wants answers and refuses her father’s wishes, instead using the old room and it’s contents to launch a renewed search for our heroes. It seems that the conceit of SFATLOE is Lucy’s need to find the nefarious Sherlock Frankenstein. He is the biggest of all the bads, and Lucy thinks Frankenstein holds the answers to what happened to her father. But Frankenstein is elusive, and no one seems to have heard from him in years, so Lucy has a lot of digging ahead of her. First stop: Spiral Asylum for the Criminally Insane, to question some of Frankenstein’s former cronies. I’m not in a spoiling mood, so you’ll have to read this issue to see what Lucy does find out. OK, a tiny spoiler… it’s a doozy! 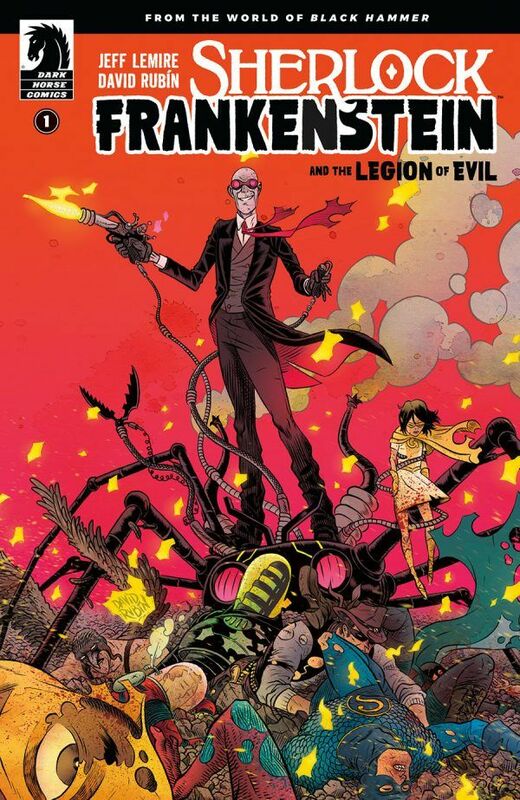 Writer Jeff Lemire has created himself quite the extensive world and back story with Black Hammer, enough that it justifies this spin off mini-series. Fans of Lemire and Black Hammer know what to expect: deep and yearning characters, a fresh take on the age-old “good vs. evil” and a cliffhanger that will bring you back next month. Another of Lemire’s trademarks is, for lack of better words, a line he created in the sand, dividing the fun or whimsical (characters with names like the Concretestador, Sultrix and Cthu-Lou) and deathly seriousness (the evil Anti-God had killed many hero squadrons, after all.) He dances all over this line with humor, pathos and obvious joy in his creations. Artist David Rubin is no stranger to the world of Black Hammer, as he drew several issues of that series. He’s main artist (as well as colorist and letterer) for SFATLOE. His layouts and panels keep the action, as well as your eyes, moving and he uses lots of two page spreads. SFATLOE is a good placeholder while Black Hammer takes a break (for how long, I don’t know). SFATLOE can serve as a good jumping in point for the world of Black Hammer, so pick up some back issues and take a ride with me. I’ve said this a number of times in past reviews but this miniseries is way better than it should be. With one more issue left Swordquest plays its cards as a story of a man coming to grips with death, while not going gently into that good night. Up until this point it seems like the magical elements of the book are legit, but Bowers and Sims could always reveal the contrary in issue #5, which brings to mind another book I read this week and will discuss in a bit. 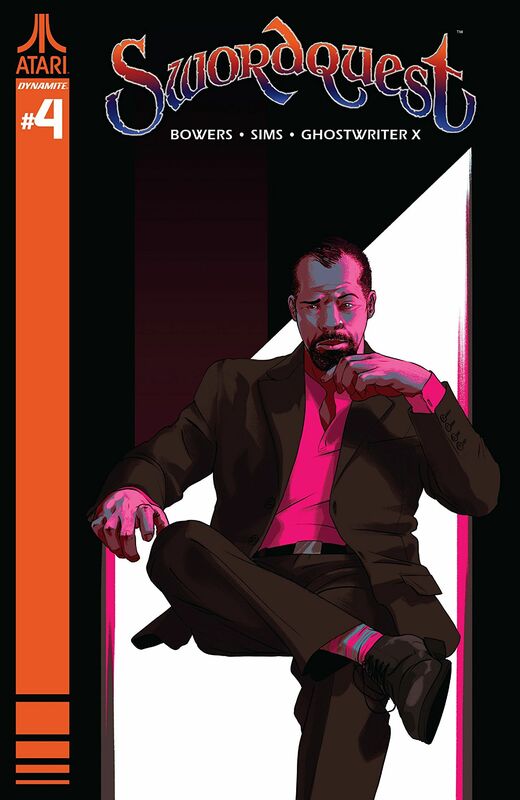 What we do know is that many elements of this book are reflective of main character Peter Case’s own damaged state of mind, but guys in cloaks and villain Mr. Juros involvement sure point towards there being some sword and sorcery afoot. Not to mention the last panel of this issue. This week I also finally got around to reading The Death of Captain Marvel. Reading this classic Marvel graphic novel has given me some context to consider some fairly common and effective storytelling tropes also utilized by the Swordquest miniseries. As listed by TV Tropes.com those tropes are ‘Do Not Go Gentle’ and ‘Dying Moment of Awesome’. While I’d say that Do Not Go Gentle applies more to both of these stories there is definitely elements of Dying Moment of Awesome happening too. How Swordquest wraps up will determine which trope will be leaned on more. Since I’m pretty sure we’re dealing with legit magic in Swordquest there’s a chance everything will be upended by the end of the final issue though. Do Not Go Gentle is a reference to the Dylan Thomas poem “Do Not Go Gentle Into That Good Night”, which I reference up above. Other phrases that come to mind include “going out with a bang” or “going out in a blaze of glory”, referencing Western films and the Bon Jovi song from Young Ones II. Dying Moment of Awesome is similar, but with more of a direct action before death, like a final strike or Boromir killing twentysomething orcs. There are effective ways to utilize these tropes, and there are ways to botch it, especially in a written context and in the comic book medium. The Death of Captain Marvel does not botch it, and in fact set the standard for comic book deaths in the decades to come. Published in 1982 and written and drawn by Jim Starlin, The Death of Captain Marvel delivered on what was still an uncommon occurrence in comic books at the time, which was permanently killing off a character since that would be upsetting in a medium still considered as targeted towards children mostly. Captain Marvel (aka Mar-Vell) does not die in battle, he dies from the very real menace of cancer. How he dies is touching and heartbreaking, surrounded by loved ones, his friends and even some enemies. It is the mind-boggling last act of this story that makes me wonder what direction Swordquest will take. In it Captain Marvel is seemingly revived by Thanos, who we’re led to believe is dead and forever encased in stone in the bowels of the planet Titan. Thanos leads Mar-Vell through a cursed land full of undead terrors that he fights off valiantly. In the end they encounter Thanos lover Death, Who Mar-Vell also embraces before he is taken. Mar-Vell is given the chance to go down fighting, and he steps into the beyond with an enemy who turns out to also be afraid. It’s a twist that plays into the habit of comic books resurrecting people from oblivion, only this time it shows us that death is inevitable. I’m confident in Bowers and Sims going in a similar route of the fantastic Marvel graphic novel. 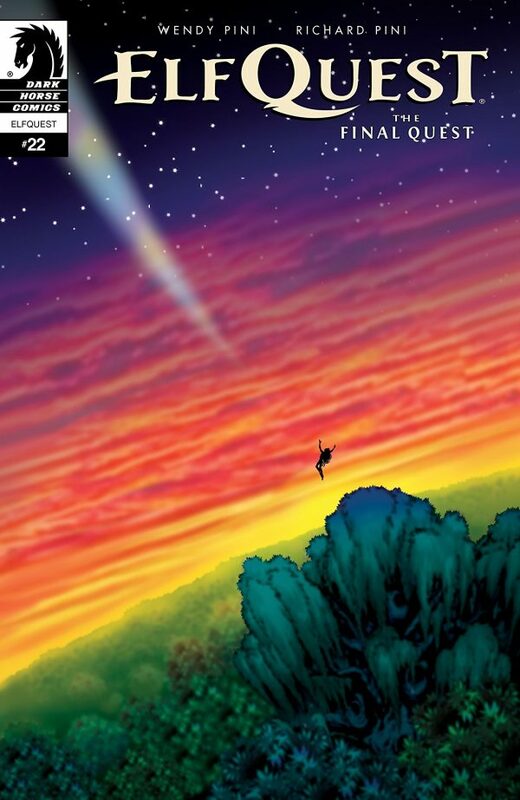 With the last act starting at the end of this issue we see Peter seemingly going on his final quest, like Mar-Vell it will most likely be in a strange land full of terrors. While there is a possibility that magic will intervene I hope that whatever happens we see Peter check out of this miniseries the way he wants to, with his prized sword in hand. I’m really impressed with Bowers and Sims take on mortality that’s disguised as a cash-in book on an Atari video game. With everything in my life that’s going on right now I can attest to the harsh and cruel reality of death, but I can also attest to the power of the human spirit. It is a strong, tenacious and inexplicable light in the dark. Rage, rage against the dying of the light. This is the third-to-last issue of The Final Quest, so it’s no surprise that it’s organized as a long string of farewells. Issue #21 primed us for goodbyes both sweet and hard with the conclusion of Door’s long journey to the Palace – resulting in a surprising and moving end to his mission – and with an emotionally intimate moment between the brothers-in-all-but-blood, Cutter and Skywise, in the final eight panels. Much more happens between members of the World of Two Moons’ various elf tribes, a group so sprawling that it takes an extra-long issue to contain their comings and goings this month. That extra length begs the reader to take their time with the chapter, and those who do will be rewarded with a plethora of rich character interactions to savor. A moonlit conversation between Cutter and Rayek is a particular highlight. Pini keeps both of them in silhouette, driving focus to their body language and physical interactions. The moment Cutter reaches out to clasp his one-time rival’s shoulder may be the moment two allies bloom into full-fledged friends, or is perhaps an acknowledgement that the moment had already come long ago. Mother and Child Moon overlapping in the night sky above the two nicely underscores the point. Throughout the chapter, Wendy Pini scripts each scene as thoughtful lead-ins to or parallels of others, which lends a satisfying cohesiveness to the issue’s overarching narrative. The Final Quest has always necessarily jumped from location to location while telling the stories of its characters (there’s that sprawl again), so the gentler flow from one place to the next in this issue makes for a pleasant ride. However, any Wolfrider worth their salt would know to beware of any purposeful lull, so be assured there’s still plenty of high-stakes drama in the issue. The Wavedancers get the bulk of the action-oriented scenes, with Reef leading a charge to cripple some of the war-men’s plans. He appears in both his “strong-scary” shape and his elfin one, and has a great moment with Puffer where he points out that both are what make him himself. These small, true moments between the elves have always been what’s kept me coming back to ElfQuest. I recently saw Wendy and Richard Pini talk a bit about the series at New York Comic Con, and I was struck by Wendy explaining that a lot of what has happened in the almost 40-year series (The Final Quest is slated to end on EQ‘s 40th anniversary) is based, simply, on things that happened in the creators’ own lives. Unsurprising, in that case, that these elves should so constantly remind me of my own humanity.